ECOs can become very complicated in some scenarios. Using only automatic mode would give unacceptable result. To achieve optimal ECO patch, Automatic ECO and Manual ECO have to be used together. For example, the ECO case in right hand side requires a new bus port (IN_B) to control half of the logic (LOGIC B) that is controlled by bus port A (IN_A) originally. LOGIC A and LOGIC B may have overlap. 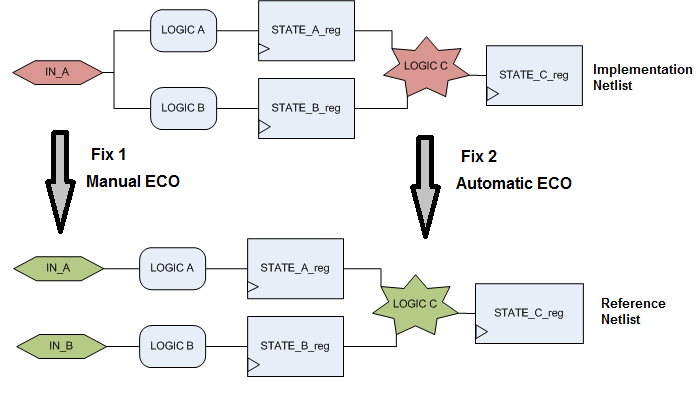 LOGIC C is required to be fixed as well and it has data path changes which has to be done by Automatic ECO. When apply only Automatic ECO, Fix 1 (IN_A/IN_B/LOGIC-A/LOGIC-B) needs ~200 gates. Use GOF APIs to analyze logic paths from port IN_A to STATE_A_reg and STATE_B_reg, we can find that LOGIC A and LOGIC B have very few gated shared. Duplicating these shared gates, there would be clean cut of LOGIC A and LOGIC B to make them being driven by IN_A and IN_B separately. Click here for this mixed mode ECO use case.